Alright, so these bad boys are BRAND NEW. I order the DUAL FORMS online from hong kong. The shipping took forever, but I eventually got them. I was so excited I could hardly wait! I didn't set my camera up & I tried my best to take pics while testing these bad boys out! I think they turned out really cool. The dual forms are really nice for someone who doesn't want to have to spend a TON of time filing & doing each finger nail individually. Once the form is removed all that is needed is to shape then nail, the acrylic design comes out super shiny, its really nice. THE FORMS ARE REUSABLE - which is really nice! So for $3-$6 for 100 of them, that's is CRAZY cheap! I prefer to do the designs flat out the old way, but these are really cool. Have you tried these? Seen them? Whats your opinion or thoughts on these dual forms??? i just got mine in the post today, ui was super excited too!! ive done two nails in tw odesigns already, i like them, i like how shiny they are and smooth!! 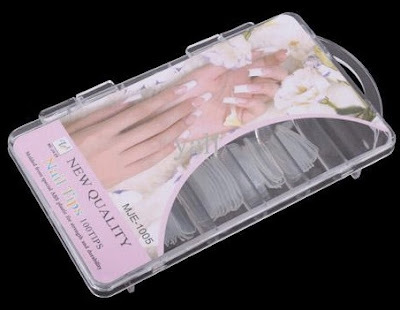 with out spending for ever filing and buffing to get them perfect.. i also like how you can do loads of different designs with them, and add nail art and such :) theyre great!! how thick on average should the acrylic be in the form ? Sorry about the late reply, but the acrylic should NOT be very thick. if there is too much acrylic when you press and apply to the natural nail it will ooze out of the sides making a mess. When you did the design (step 1), did you paint regular nail polish directly onto the form? Or did you put acrylic down first?